My name is David Howell, sole owner of Carolina Aquatech Pools. In 1956, Carolina Pools was founded by my father Tom Howell Jr.. In 1965, he joined the Aquatech Corporation and stared Carolina Aquatech Pools, which is made up of Elite Pools Builders from all over the United States. In 1972, my father past away and I became co-owner of Carolina Aquatech Pools. 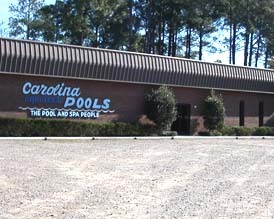 In 1976, I came to Fayetteville NC and started Carolina Aquatech Pools first retail store (shown to the right). We have a combined pools experience of over 75 years to build you the finest in Viking inground fiberglass pools and Doughboy above ground pools. We also carry BioGuard chemicals, Pentair Pool equipment. a full line of parts including Pentair, Hayward, Polaris, Doughboy, Kreepy Krauly, Baracuda, Sta-Rite, and a full line of pool and spa accessories .We will give you professional advice on the care and operation for your pool or spa . We are North Carolina’s oldest pool company. With our many years of professional experience, we at Carolina Aquatech Pools pride ourselves in giving you, the customer, the best in pool and spa care and maintenance.